Depending on the desired affect, Angry Beaver Arboriculture and Tree Surgery Services offer the following flavours of Crown Reduction. 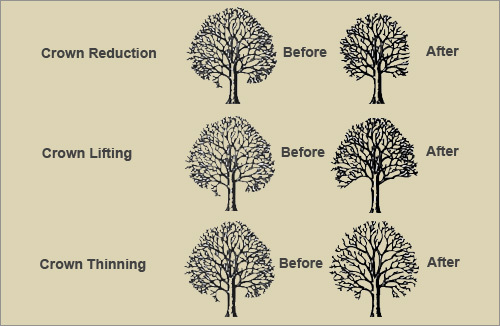 Crown Thinning Technique - Where a tree is restricting light to a property, Crown Thinning is often a more desirable and aesthetically pleasing approach to the problem than undertaking a height reduction. By removing selected branches from within the canopy the light passes through the tree more easily without reducing the overall size or shape of the tree. Crown Lifting Technique - Removing the lower branches from a tree to gain more clearance beneath its branches. Crown Reduction Technique - Reduction of a trees canopy, shaped to make it more aesthetically pleasing and more compact whilst retaining the trees shape.